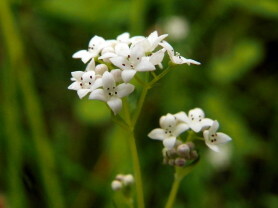 Marsh Bedstraw (Galium palustre) is sometimes known as Common Marsh Bedstrow and is a member of the Bedstraw Family. Marsh Bedstraw can reach a height of 10 – 50 cm in height, with a semi limp stem, that is delicare with a glossy, rough edge. The flower of this plant is white and roughly 3 – 5 mm wide with up to 6 whorled leaves, typically there are only 4 leaves. The leaves are rounded tipped with thin bristles and are often found on stream banks, ditches, swamps, damp meadows and sometimes sea and lake shores. There are two species of medium height bedstraw that are found growing in damp soil, marsh bedstraw and fen bedstraw. Out of the two, Marsh Bedstraw is the taller of the two species but is easily identifiable by its lack of bristles. The flowers appear around June to August, with white, loose clusters of flowers at the end of the stem. Preferred Conditions: This plant can be found in wet meadows, marshes, fens and pond edges and thrives in acidic soils.